We’ve been in the taxi for about thirty minutes, driving far outside Chiang Mai. I’m with three friends, two young Americans and a British man, and we have slowed down our idle chit chat to collectively stare out the window. The taxi crawls forward; the driver is checking Google maps on his phone, searching for our destination. This is not normal tourist territory. Finally the driver stops in the middle of a small neighborhood road, pointing us toward an unassuming restaurant, lit up by lights and conversation. “YES!” Exclaims one of the young Americans “it’s open!” We all start to smile, following him inside and finding a table. A server quickly approaches us. “You speak Thai?” she asks nervously. We all look at each other. Uh oh. The background: I had met these three friends on Wat and Poh’s WWOOF farm, and we were coincidentally in Chiang Mai at the same time. The two Americans, Tommy and Phil, left the farm the same day I did, and we met up with our British friend, David, who had left before us and spent the previous few days in the city. 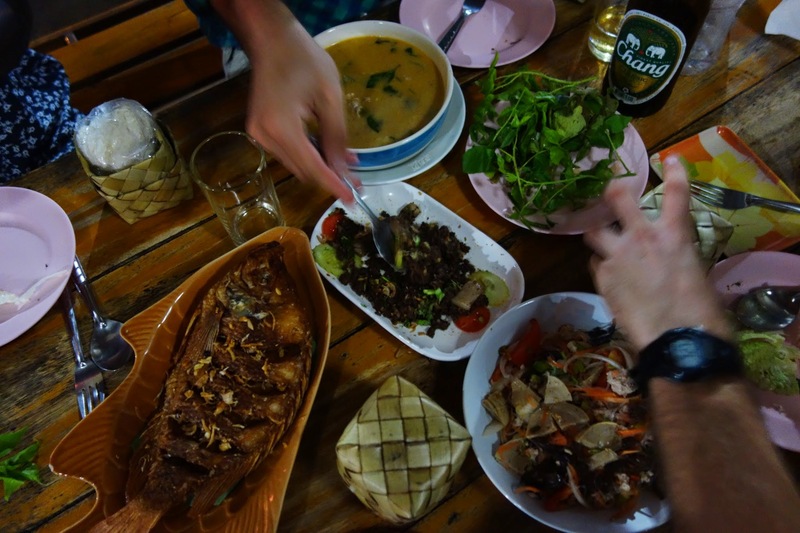 Before coming to the farm, Tommy and Phil had extensively explored the culinary scene in Chiang Mai. Phil, a chef in the states, and Tommy, a person who likes good food, searched out the best street stands and hideaway restos. On one particularly off the beaten path trip, they walked into a crowded restaurant, ordered, and started to look around. They were the only foreigners, except for one other man- who Phil recognized as Andy Ricker, the essential authority on northern Thai cuisine in America. He is the owner of Pok Pok, a highly awarded restaurant with locations in Portland and New York. Andy has visited Thailand for years, studying the cuisine, culture, and language. There is no better American authority on where to eat in Chiang Mai, and my friends had the good luck to run into him. He directed Phil and Tommy to his Instagram account, because this trip, he had been documenting his favorite dishes and their locations. And so, the admirable Phil and Tommy began their self proclaimed “Andy Ricker’s Leftovers Tour”, following his recommendations around the city. They were led to some amazing meals, but they became obsessed with one photo, one restaurant: you can see it here here. The description could not have been more accurate for Phil and Tommy- the first time they took the long taxi ride, barely locating the restaurant, they arrived only to find the restaurant closed. The second time, after even calling ahead, they found the restaurant closed. They then traveled to the farm, leaving the mysterious restaurant as unfinished business in Chiang Mai. Back to the present: Phil and Tommy had come back to this restaurant for the third time, accompanied by me and David. It was open, to our relief. But Andy Ricker, fluent in Thai, had no problem ordering here- we did. The menus were in Thai, the server only knew the words “chicken” and “pork”. In our arrogance, fuelled by the tourist-friendly restaurants in downtown Chiang Mai, we had assumed that we could get by with minimal Thai. We sat together at our table, frantically discussing all the Thai dishes we could remember the names of. David’s cigarette break saved us- while smoking outside, a Thai customer struck up conversation with him, saying that she had lived in England for a few years. After David explained our situation, she graciously came to our table and offered her translation services. Tired, hungry, and already deep into our Chang beers, we told her, “we want four orders of sticky rice, and seven different dishes, whatever they make best. We’ll eat anything.” She relayed our order to the confused and entertained staff, and we awaited our fates. There are meals that are memorable for their culinary artistry, and there are meals made memorable by their ambiance. This meal was both. Each time a new plate arrived, we all expressed awe and reverence, a confluence of both the delicious flavors and our blind surprise. Excepting the growing collection of empty beer bottles, we were like children discovering a new world. It was all delicious, and Thai-level spicy, which always prompts me to eat more, eat faster, before the spice catches up with my tongue. Every dish was new; every dish was unexpected. The soups were amazing, with the complex yet subtle broth that southeast Asia seems to have mastered. We ate every last bit off the fried flounder, piling bones on the plate. I switched between scooping up the pork laap (minced meat salad) with my sticky rice and eating the noodle salad, until the chili heat became so intense I had to pause to wipe the sweat off my face. At the end of our meal, we picked at the food for a while, lamenting our full stomachs for preventing us from eating every bite. Our feast had been finished, and we sat back, content. I love the satisfied silence after a good meal, punctuated by deep sighs. Good meals are not just about the food and flavors. The story matters, the people, the context, the irreplicable elements. The meal tasted sweeter for the anticipation. The flavors were more vivid for the adventurous spirit of the company. The laughs were louder for the joy in the situation. When I think about good meals, I remember the food, but I remember the story behind it much more vividly. And this story, the time we feasted with no idea what we were about to eat, will stay with me. Hard to find, easy to love indeed. This photographer was too distracted by the meal to properly document it. However, this photo captures the most important elements- the people, the food, the beer. A meal to remember.